At this point, it’s safe to say that we’re going to be receiving a new ‘highest resolution image ever’ of Pluto on a close to 24 hour basis. Yesterday, we got our first peek at geologic features on the dwarf planet’s surface. 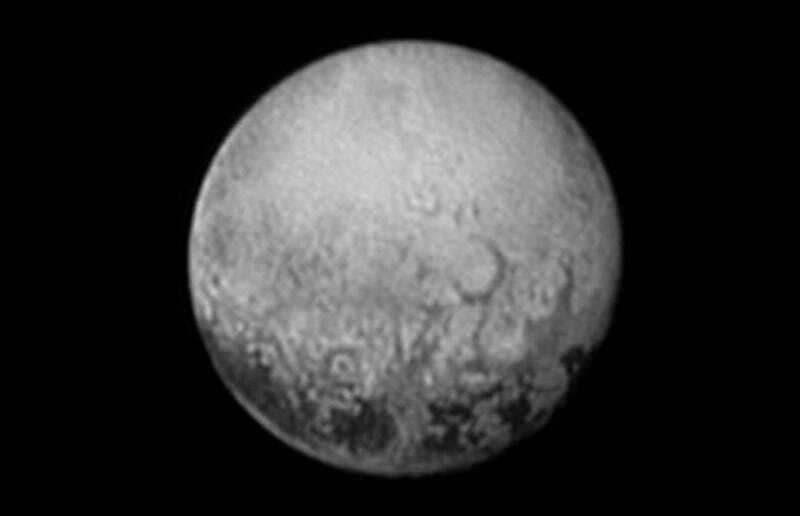 And today, New Horizons beamed back the best image to date of four mysterious dark splotches near Pluto’s south pole. The image above was captured when the New Horizons spacecraft was a mere 2.5 million miles from Pluto, and over 3 billion miles away from the Earth. The dark spots appear on the hemisphere that always faces the moon Charon—the same side that’ll be invisible when New Horizons makes its closest approach on July 14th. Each one is now estimated to be roughly 300 miles across, and we haven’t a darn clue what they are. But, when this image is combined with composition and color data New Horizons hasn’t yet sent back, the Geology, Geophysics and Imaging team is hopeful it’ll be able to solve the mystery. What could the dark splotches be? What’s up with the whale tail? Why is Pluto red? We’ll have answers to these questions and many, many more, by Pluto tomorrow.